Just like the rest of the northwest Hamilton is really feeling the effects of winter. It is ranging from the teens down into the single digits here. 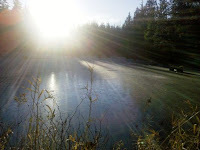 The pond is completely frozen now, as well as a lot of the ground. It almost feels like we have permafrost. 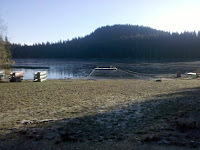 The lake is also starting to form a thin layer of ice on the top. The staff are still braving the cold to work on the high ropes course. I'm however, holed up in the camp office with the heat on working on staff training. It was so pretty this morning when I drove in that I snapped these pictures with my camera phone. Hope you're all staying warm!